Can I Make My Ex Wife Change Her Last Name? Although no law in the United States requires a woman to take on her husband's surname when she marries, it is a popular tradition. Once a woman legally changes her name through marriage, the name is hers to keep. This is true even if she and her husband divorce. Regardless of how uncomfortable it makes you, your ex-wife may have legitimate reasons for keeping your last name. Depending on how long you were married, your name may be an integral part of your ex-wife's identity – especially if all her personal and financial records appear under your surname. If the two of you have children, your ex-wife may choose to keep your last name to have the same last name as her children. You can talk to her and ask that she give up your last name, but you cannot legally force her to do so. If your divorce is not yet final, consider negotiating your wife's return to her maiden name as part of the divorce decree. If she agrees, the name change becomes part of the divorce settlement. Once the divorce is finalized, her surname will revert back to her maiden name. 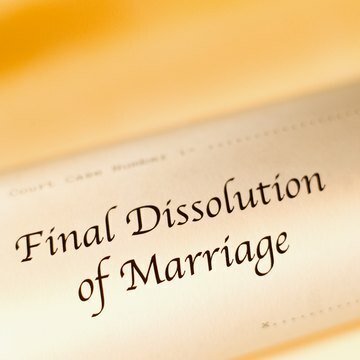 Although the divorce decree legally changes your ex-wife's surname, she remains responsible for filing the appropriate paperwork with the Social Security administration and the Department of Motor Vehicles in your state to change her name on both her Social Security card and her driver's license. Depending on your state of residence, you may be able to modify your divorce decree to include the proposed name change after the divorce is final. Because the divorce is already final, you have less leverage to coerce your ex-wife to make the request to the court. Not all states permit divorced couples to modify their divorce decrees to include a name change. Although it is free for a woman to change her name upon getting married, changing a surname after divorce can be costly. The fees for this process vary by state, but can range anywhere from $150 to $200 dollars or more. If the cost of a name change is the motivating factor behind your ex-wife retaining your surname, offering to pay for the name change could motivate your ex-wife to begin the process. If your ex-wife is keeping your last name for the children's behalf, offer a compromise in the form of a hyphenated last name. While adopting a hyphenated name does not erase your surname in its entirety, it does prevent her from using your name alone. A hyphenated surname also allows your ex-wife to keep the name she shares with the children. Meriweather & Tharp, L.L.C: How Do I Change My Last Name Back to My Maiden Name As Part of a Divorce in Georgia? Once the honeymoon is over and life's administrative minutiae kick back in, the newly wedded woman may discover that streamers of white satin ribbon have turned into a whole lot of red tape. Taking your husband's surname means a trip to the Social Security office so that the name on your Social Security card reflects your identity as a married woman. If you decide not to change your name, however, this is one "to-do" that you can scratch off of your list: You're not legally required to get a new Social Security card when you get married.